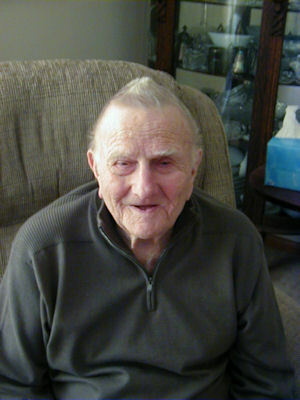 Meet Your Neighbor Harold Nolen of Stronghurst born in 1912 and raised on the Nolen Family Farm outside of Stronghurst. It has been owned by the Nolen family for 120 years. Presently, Byron Burg farms the farm. In 1930 Harold graduated from Stronghurst High School and in 1934 continued his education at the University of Illinois School of Agriculture. He was awarded a full 4-year scholarship from the Farmers Institute to attend the U of I. The award was given to those students who exhibited leadership skills in the agriculture field. He was a vocational ag teacher for 14 years; 2 years at Bardolph and 12 years at Pleasant Plains near Springfield. Mr. Nolen said proudly, "I still have students who keep in contact with me." In 1949 he returned to the family farm and lived there for 46 years. He purchased his sisters shares of the farm in 1985. In 1935 he wed his lovely wife, Lois. In 1994 he and Lois moved into Stronghurst and bought the home of Dr. Pogue's parents. They were married for almost 65 years before she passed away with ALS in 2000. To their union they gave birth to a son, Richard (Linda) who lives in Bloomington and a daughter, Mary Ann Norwood Nolen. Mary Ann lives in Rockford. Richard is employed by a plastics company out of York, Pennsylvania, and Linda is a registered nurse. Mary Ann owns a counseling service called, Pathway Employee Assistance. Harold has five grandchildren, Craig Heacock, a doctor in Fort Collins, Colorado, Heidi Young, a homemaker, Marissa, a designer for catalogs, Laurel, a language specialist for the FBI and Julia who is an educator. He also prides himself in telling about his 5 great-grandchildren with photos of his family adorning the fireplace. A sister, Lucille is deceased and another sister, Doris, lives in Greeley, Colorado. A sister-in-law, Mary Livermore resides in Roseville. For many years he has been active at Bethel Lutheran Church and served on the church council but said, "The last two years I just haven't been able to do as much as I would have liked." The Nolen family has owned a cabin at Shokokon for about 50 years and Harold loves to go down, get in his little boat, and fish. He said, "It is so relaxing and whether I was farming or busy with something else, I always took time to fish and just relax." He said the largest bass he has ever caught was 3 1/2 pounds. He has been subscribing to the Quill for 80 years. His mother started sending it to him when he was a student at the University of Illinois. At that time it was not The Quill, it was entitled, The Graphic. While in college he played football for two years, was a member of the livestock judging team, and a member of the Alpha Gamma Rho Agriculture fraternity. At that time there were 14 members in the house. He later was a judge at many county fairs. He said, "I really enjoyed judging even though some folks may not have agreed with my decision!" He and classmate, Jessie Norwood, both attended Cox School. He said, "In fact we are probably the oldest living students of the school!" His friend, Ann Mulholland, is very precious to him as she has been helping him with his medication, doctors appointments, preparing meals and other tasks Harold needs done. He said, "If it wasn't for Ann I would have been in a nursing home five years ago." His eyes are not quite as sharp as they were a few years ago so he has a reader machine but also enjoys listening to Ann read the Bible and other books to him. The Henderson County Health Department checks on him weekly. He said, "They are great to come and check my vitals and answer any questions I might have." He has been a Mason for 59 years, a 21 year board director at the Bank of Stronghurst and now serves as an Emeritus director, a member of the Henderson County Fair Board for 10 years, a member of the Zoning Board for 20 years, served 9 years on the Henderson County Soil and Water Conservation District, and was on the board of directors, several years, for Stronghurst Grain and Merchandise. While interviewing Mr. Nolen I also learned that, as a high school student, Mr. Nolen stayed overnight in the stone house where my husband's family lived. I believe, it's been said, "It's a small world"! Mr. Nolen is a fine, and very wise, gentleman with many years of interesting and exciting stories.